There are two large crabapple trees here and both are laden with fruit this year. I filled a carrier bag with them today and the trees look no different. Therefore, I have to find something to do with a huge glut of crabapples. You can only eat so many of these before you double up in gut-agony so alternatives had to be explored. Crabapple cider is a possibility. I do have some large fermenting bins here. I also have to clear the lab soon so I’ll have a lot of 5-litre conical flasks with nothing to do. Then again I do have a lot of grapes this year too. I will also bring home a 4-vessel continuous culture system with the temperature controlled by a water bath. Continuous booze production could become a thing. A tip I picked up for home cider making when you don’t have a juicer. Cut up the apples and freeze them for a few days. Turns them to mush. Much easier than trying to juice them fresh, by hand. Of course, that does mean you can’t rely on the natural apple yeast but wine yeast is cheap. There is a pear tree too. That’s a recent discovery. CStM noticed it first because it carried one lonely, sad-looking pear. I think it needs a bit of TLC. Chainsaw TLC. I have to get a chainsaw. While searching for things to do with crabapples that involve alcohol, I came across crabapple whisky. There are many recipes out there. This is the one I used. With slight adjustments. I was not going to use a good single malt for this first experiment but then I didn’t want the real low-end crap. No need to buy that anyway, with the Spiteful Nannying Puritans’ new minimum booze price, the toilet cleaner whiskies are the same price as some far, far better ones. I wanted some decent but low-price whisky. Aldi have Famous Grouse at £14 for 70 cl, and they now have Highland Black in a 50 cl bottle so they can sell it for £10. So I bought those. We already have 1-litre jars here from CStM’s past pickling experiments. 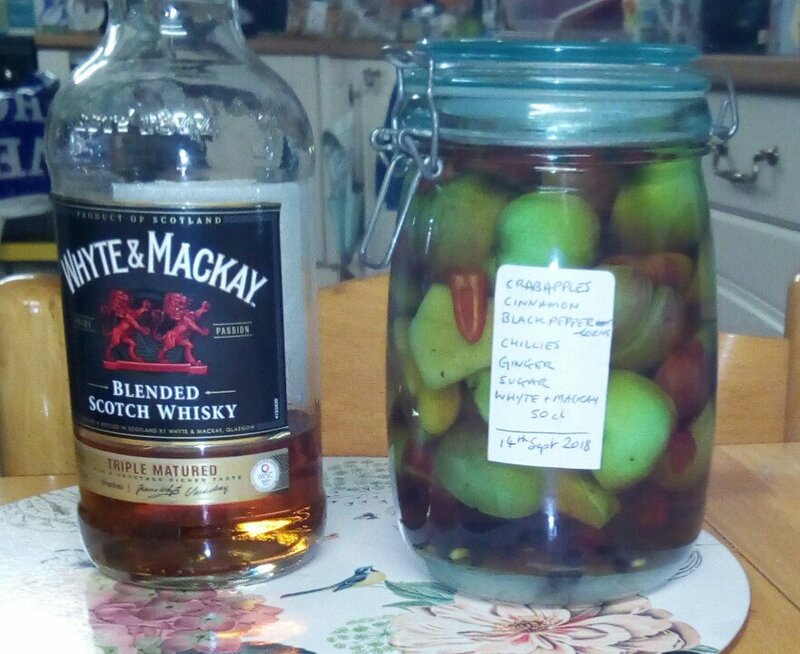 Considering the volume of fruit going in, we reasoned that a 50 cl bottle of Highland Black would probably be enough. It was. I prefer the 70 cl bottle because there’s some left over, but experiment comes first. I weighed out 750g of crabapples as required but I also had about 200g of blackcurrants in the freezer from the earlier blackcurrant harvest. Not enough to do much with, they were bound to end up blended with something so they went in here. That meant that for the two jars I made today, the 750g of crabapples plus a few extra was enough for two jars. Crabapples washed, dried and halved (quartered for the bigger ones). Load them in to cover the bottom, add two tablespoons of sugar and one slice of fresh ginger root (I cut off the outer skin). Then pile in some blackcurrants and cover with whisky. Another layer of crabapples, one tablespoon sugar, another slice of ginger and more blackcurrrants. Cover with whisky. If you just fill the jar with apples first they’ll go brown too fast. Same again, another slice of ginger, two spoons sugar, cover with whisky. Finally fill with apples and make sure the whisky covers everything. This won’t be easy because the bloody apples float. Oh, they float. They all float down here. Sorry, drifted away for a moment there. I filled it right up with Highland Black and let the lid press them down. This jar had no blackcurrants (I used them all in the first jar) so this one had a cinnamon stick added at the halfway mark. Otherwise the procedure was the same. Jar two also used Famous Grouse whisky and to my delight there were a few drams left over. All the blackcurrants fell to the bottom anyway. So the careful measuring was a waste of time. I have another of these jars and some smaller ones too. 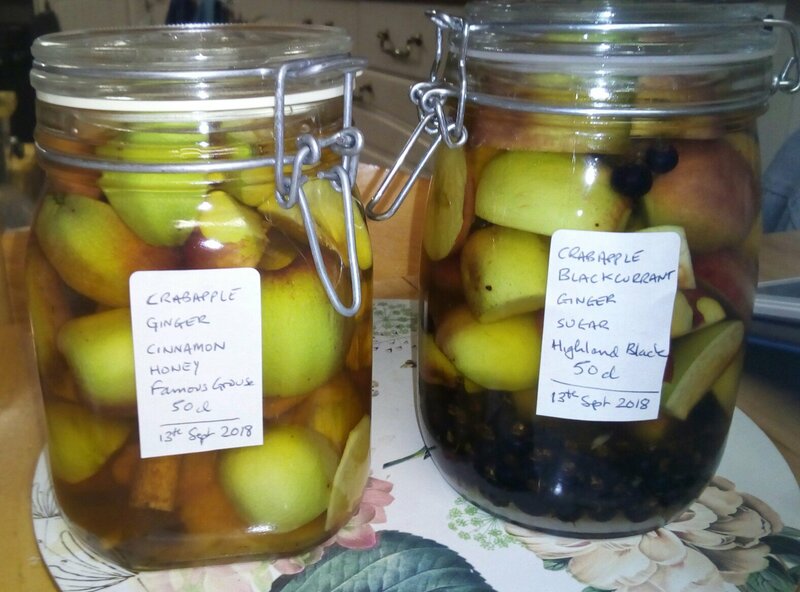 Tomorrow I will get either another Famous Grouse or a different decent low-price whisky, maybe Whyte and MacKay, and make one with ginger, cinnamon and chliies among the crabapples. I always have a good crop of chillies. I expect I’ll pour it into a jug through muslin and then into a decanter or empty whisky bottle (you can’t buy them empty, they all come inconveniently full but I have a way to fix that). How does it taste? I have no idea and won’t know until Christmas at the earliest. That’s why I didn’t risk the malts. If it turns out really good then I might try with a decent malt next year. There are still loads of crabapples left. Cider recipes will be next. If there are enough left, maybe a pie. But hey – priorities! Update: I might be pushing the envelope with this one but I had so many chillies, I really had to try it. I suspect it will be hard to find independent taste testers though. This entry was posted in Drinking, Homebrew by legiron. Bookmark the permalink. There’ll probably be a few left over for that. Crabapple jelly – fine as a jam with bread but super with roast pork. This is the recipe I use. Thanks for that – but windfalls are not an option. The sheep eat any that hit the ground. Still, I am pruning the trees hard while getting the apples – they have been neglected for years – so getting underripe ones is no problem. I have Bramleys and crabapples and a couple of trees of sweet apples to take the harshness off it.